Join us for the Macleay Valley Business Awards Launch event to kick off our Annual Celebration of Local Business! The Macleay Valley Business Chamber are delighted to be partnering with our Major Awards Sponsor Coastline Credit Union for the second year and to announce the commencement of the 2018 Macleay Valley Business Awards. Mingle with the 2018 Awards Sponsors who are championing the success of our region through their support of the Awards. Their support provides the opportunity to local business to reflect on their business journey, celebrate with their team and grow their profile both locally and further afield. 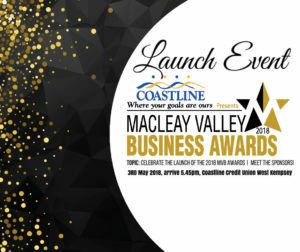 The Awards are a great opportunity for local business to share their stories and be recognised for their contributions in building a stronger economy in the Macleay region. So come along and meet some new faces and toast to the opening of the 2018 Macleay Valley Business Awards! While the evening is complimentary, bookings are important for catering purposes. Refreshments will be provided. As a Sponsor you are highlighting your organisation as one who cares about the success of our region. Sponsors are recognised as local champions who support the acheivements of other local business in the Macleay Valley. Aligning your organisation with the Macleay Valley Business Awards makes a statement that you are a forward thinking and progressive business and Sponsorship offers numerous benefits to promote this during the Awards process. Please visit www.macleayvalleychamber.com.au/2018mvba/ for more information. If you have any specific questions, please contact Lisa McPherson on 0422 210 824 or email admin@kempseychamber.com.au.